I hope everyone is enjoying their Christmas break! I was sent a few stamping plates from Messy Mansion to review and I used the Lily Anna 08 plate to create the stamped nails in this mani. My nails are a bit shorter than normal due to a break I had which resulted in me filing down my nails. 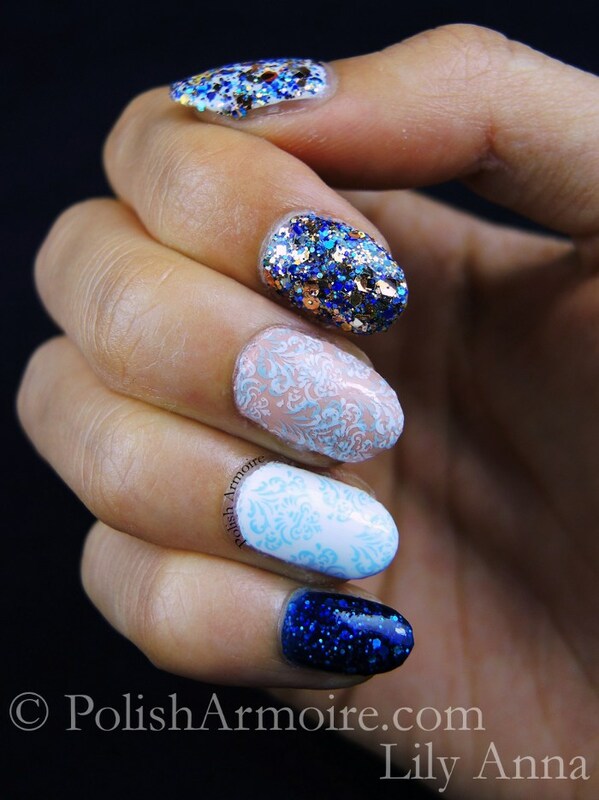 On my index finger I used two dabbed coats of Star Kin Noely, a mix of copper and blue glitter in a clear base that has various sized hexes and a sprinkling of stars. On my thumb I dabbed one coat of Star Kin Noely over one coat of Cult Nails Tempest, my favourite white creme polish. On my pinky I used two coats of Star Kin Mariana which was created by Harriet over at Nailhilism – she has much better photos of it in her blog post! I wasn’t able to get the holo glitter to show in the photo but it contains various sized holographic blue hex glitter which flashes green and blue in a dark navy blue jelly polish base. For the stamped nails I used 3 coats of Milani Bare in Mind, a peach-toned beige jelly on my middle finger and two coats of China Glaze White on White on my ring finger. I stamped both fingers with Sally Hansen Insta-Dry Blue-Away, a light blue creme that was kindly given to me by Serra over at Peacock Pie. I also used Cult Nails Tempest to stamp over the Sally Hansen on my middle finger to get a nice two-tone effect. Unfortunately my camera washed out the contrast between the stamping and the base on my ring finger but it had a lovely porcelain effect in person. 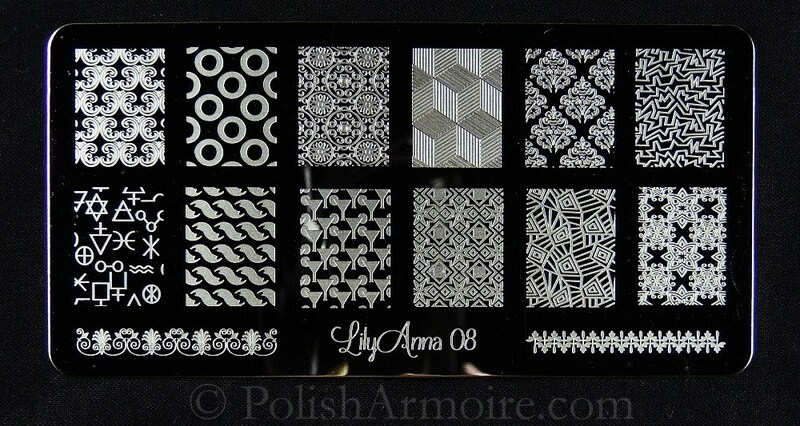 I tested out a few of the designs on the Lily Anna 08 plate before deciding on the final pattern to use and they stamped well. The 3D cube pattern is definitely interesting and if you are using a squishy stamper, be sure to use a light touch when picking up the stamp in order to preserve the straightness of the lines. 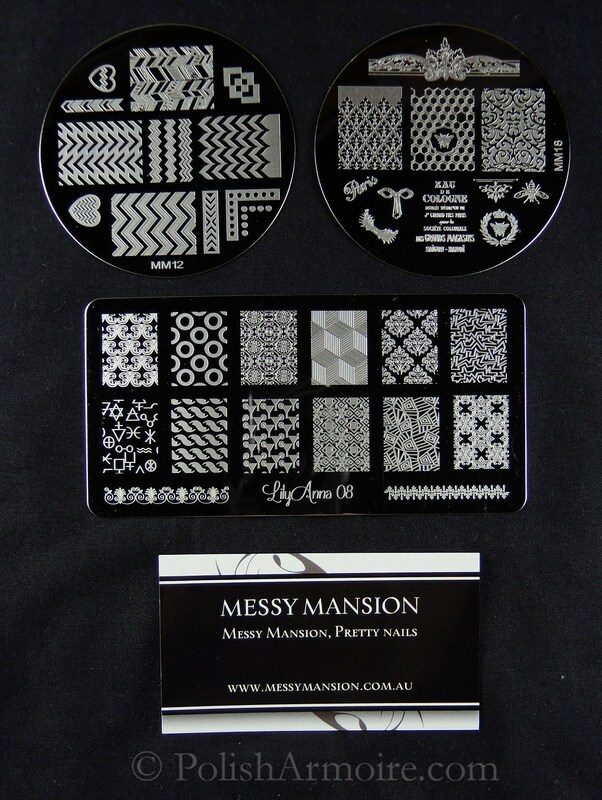 I also received the MM12 and MM18 plates for review as shown above – aren’t the designs gorgeous? I’ll be featuring stamps from these plates in my skittlette manis in the future so keep posted. I’ve also got my eye on some of the MM chevron designs in particular! I will be doing a plate size comparison with various other brands in a future post, the MM plates are definitely on the larger side of the scale which is great for my longer nails! Messy Mansion ships most of its stamping plates in envelopes, however they discovered that Lily Anna plates tend to bend during shipping due to their shape so orders containing Lily Anna plates will be shipped in padded envelopes. You can buy these plates and more at Messy Mansion’s online store and international shipping is only $2.50 for stamping plate orders – bargain! Tags: Messy Mansion, Stamping Plates. Bookmark the permalink. Ooh, these are going on my wishlist! Hey darling, you’ve just been tagged!